I have a love of spicy things. Not just hot, but like blow your socks off hot. Caliente, in fact. So, of course, it makes it impossible not to buy jalapenos whenever I’m at the Korean market. They’re always fresh, glossy and oh so cheap. Last week I bought a bag of about 20 for around 80 cents. A good Jewish girl can always find the best deal on Mexican foods, especially in K-town. 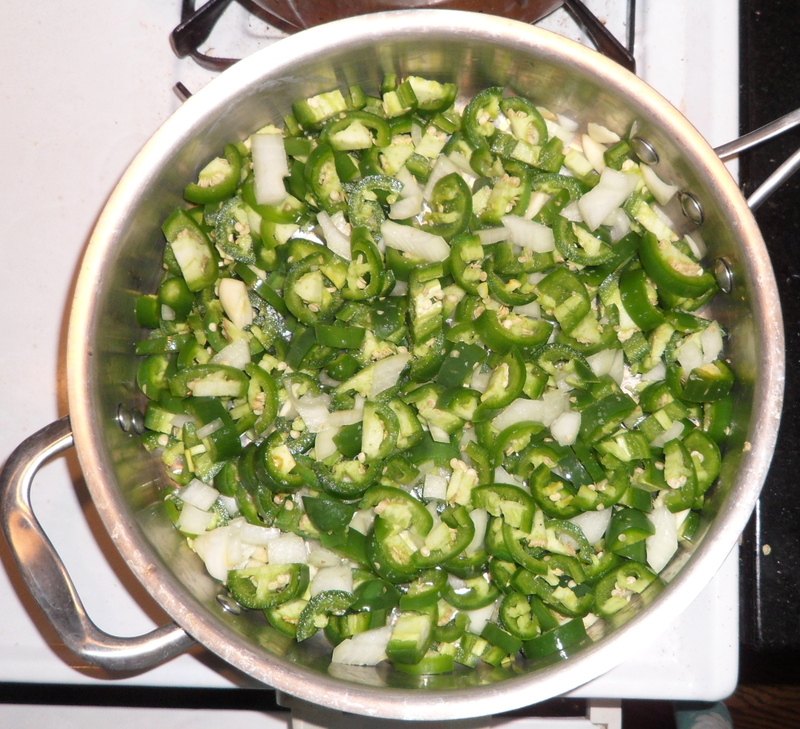 I bought the jalapenos with the intention of making a childhood favorite, hot pepper jelly. Spicy and sweet and a bright green color, I’ve been addicted since I was a child. I blame my grandmother. Anyway, I didn’t feel like getting out the canning gear today so I hunted down an easier, quicker recipe online. 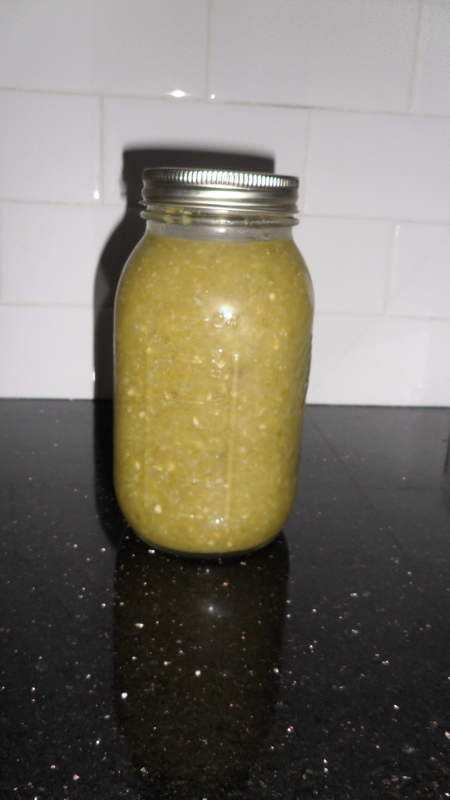 Emeril Lagasse’s green chili sauce seemed to do the trick, and was easy as can be. I diced up all 20 jalapenos along with a small white onion and a few cloves of garlic. Sauteed in a large pan with some oil and salt, I then added water before they could get any color. Letting the mixture cook down for about 20 minutes, I started coughing. Why am I coughing, I thought? Oh, that’s right, there’s the incredible spice of 20 jalapenos boiling away on my counter. I actually had to leave the room a few times just to breathe. After 20 minutes, the jalapenos mellowed in color and I left them to cool while I went rearranging my succulent nation (more pics on that soon, totally unrelated to food, of course). Once cooled, I put the mixture in my fabulous food processor (thank you, Luisa!) and dribbled in a cup of white vinegar as it churned. Then, I just poured it all (now a fine saucy liquid) into a clean glass jar and placed it in the fridge. Now, I actually don’t get to enjoy my hot sauce just yet. Emeril recommends I leave it in the fridge for at least two weeks to develop the flavor, and any man that virtually trademarks the phrase “bam!” is probably a good one to follow. I’ll report back in a few weeks when my sauce has “matured” and, lucky me, I probably will never need to buy hot sauce again. My 80 cents may be saving me tens of dollars in the future! NOTE: Do not put on gardening gloves soon after handling jalapenos. The capsicum (the chemical in chilies that makes them hot) seeped into my pores as the heat of the glove warmed my skin. I have had a burning right hand all day. Not like “oh, that burns”, more like “oh, that f***ing burns and throbs and oh my god make it stop!” Good times.